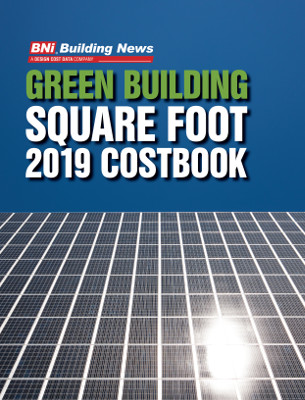 The new 2019 BNi Green Building Square Foot Costbook provides you with a comprehensive collection of 57 recent LEED and sustainable building projects along with their actual square foot costs, broken down by CSI MasterFormat section. All of the costs in the Green Building Square Foot Costbook have been carefully adjusted for 2019. The trend in green construction is continuing with more buildings meeting the U.S. Green Building Council’s Leadership in Energy and Environment Design (LEED) each year and the Green Building Square Foot Costbook is designed to help you do a better job of estimating the costs in the is important construction segment. When you purchase this book, you will also receive next year’s version for a free 30-day trial! If you estimate green construction, this book has the material and man-hour prices you need. Get your copy today!